'Tis nearly the season when food brands of all stripes participate in the annual ritual of fall: releasing holiday flavors. If it's a product that involves your taste buds, chances are there's some kind of limited-time flavor hitting store shelves right about now—from Tic Tac's Cherry Apple Twist (in red and green) to cinnamon and sugar- and pecan pie-flavored Pringles to Coffee-Mate, which will be rolling out its seasonal peppermint mocha, among other seasonal selections. In fact, the company recently announced the hiring of a new holiday flavors expert, Joel Hubbard (watch him here), who explains why a little bit of holiday R&D more than justifies the trouble. Seasonal flavors, Hubbard told Adweek, "tap into people's emotions and evoke nostalgic memories, especially during this time of year." In other words, they sell. And that, as it turns out, even applies to stuff you can't eat—like lip balm. 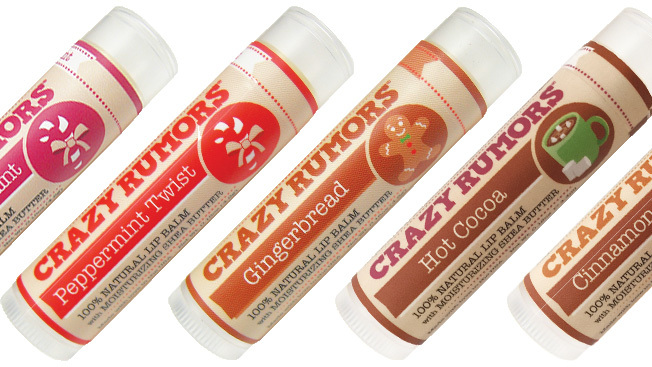 While the mass-market choice is ChapStick, the Pfizer-owned brand that's got candy cane and pumpkin pie flavors, lip balm connoisseurs are more apt to turn to a boutique brand called Crazy Rumors. The Atlanta-based company—which differentiates itself by using all-natural ingredients—not only produces 40 different flavors of lip balm but will soon ship no fewer than five special holiday flavors out to the 2,000 domestic stores in its distribution. But if customers can't actually eat lip balm, what's the appeal of holiday flavors—or, actually, any flavors? "Flavors and scents have an amazing effect on the olfactory system," Himmel said. And, according to the Society for Neuroscience, while smell and taste each have their own receptor organs, they are intertwined. So, the smell of peppermint or hot cocoa is, in a way, half the journey to actually tasting it. What's more, Himmel doesn't go through the trouble of putting out holiday flavors simply because every other brand seems to; she does it because consumers bug her for them. "We get suggestions via Facebook," she said. "We pick and choose, and narrow down which flavors seem to resonate." And that, in turn, might explain why holiday lip balm flavors run closer to cookie and candy, than rum and mincemeat pie—Crazy Rumors' core customers skew young, starting at about age 16. (According to research by Mintel, 72 percent of consumers ages 18 to 24 use lip balm, which makes up a healthy chunk of the $1.4 billion lip cosmetics segment.) Back when Himmel was perfecting her lip balm recipe, ice cream and bubble gum were among her first flavors. Much as Himmel likes to experiment with recipes, she says five holiday balms are quite enough—together with all the other flavors she makes the rest of the year. "It's up to 45 flavors now," she said. "It's kind of crazy."